A worldview is the lens through which we perceive reality. What's yours? Humankind made bad choices that caused disastrous results, lingering in every generation, causing death and moral decay. God's plan was to let those results play out for thousands of years while staging a rescue operation to take care of the sin problem. Eventually, God will rule over a restored creation with those He was sent to save. If this isn't your worldview, life won't make much sense. If this is your worldview, life is still hard but much more clear and satisfying. In 1 Samuel 23, we see that even as the future king of Israel and ancestor of Jesus Christ, David had tough times…but God was with him. One tough time was with King Saul, whose jealousy of David forced him to flee. The enmity began when David defeated Israel's most formidable enemy, Goliath, and continued as Saul saw that God was with David in all he did. Probe: What was your worldview prior to coming to Christ versus now as a Christian? Saul hunted David daily, "but God did not deliver him into his hand" (v. 14, emphasis added). The words but God change everything. Even though bad things happen to good people, that is not the end of the story. And because we have an all-powerful ruler who cares about us, malicious plans don't always succeed. Some bad things can last for a while, like David being a fugitive, but God allowed it to only go so far. Beyond the havoc was a gracious God. Saul was allowed some freedom to hunt David because it served God's purposes. Suffering can be beneficial to the life of a believer. At times, God uses it for His glory and to accomplish His purposes. Both mankind and Satan operate within parameters set by God (see Job 1:6-2:10; Matthew 8:28-34; John 19:8-11). Only with permission and only for God's purposes will He allow bad things to happen. The words but God means that things could have been worse—without meaning or purpose. God's ways are not just behind the scenes; He moves all the scenes He's behind. Probe: Discuss a time in your life when suffering was beneficial. How did the hardship change your worldview? David didn't throw all caution to the wind and fight back because he wasn't a fatalist. He still used his mind, applying strategies to get out of a predicament. He believed in both the sovereignty of God and the responsibility of man. Some people have a passive view of God's sovereign nature. They feel they are passengers along for a ride in God's fast car, so why organize or strategize? David was different. He thought that God might deliver him, but he had a decision to make, so he hid himself and God used it to deliver him. Jesus discussed something similar in the parable of the unjust steward. He made a point about using our heads: "For the people of this world are more shrewd in dealing with their own kind than are the people of light" (Luke 16:8, NIV). While God is being sovereign, make sure you're being sensible. Probe: There is a mystery to how God works all things together in the lives of believers. God often works supernaturally, naturally. Share about a time when you felt God was working through a natural circumstance to enact His will. Even with God's deliverance and divine protection, we can be discouraged easily. We all need support, even people like David. In bad times, trust a good God, use good sense, and get around good friends. Jonathan "strengthened [David's] hand in God" (v. 16). He encouraged him to trust in God's promise that David would be king. David's spiritual edge was sharpened by Jonathan's iron friendship, forged over a common love for God. The best friend you can have is one who points you back to the God you love. No matter who you are or what you've done, no matter how you've lived or the mistakes you've made, look for those two life-changing words: but God. David was being chased and attacked by Saul, but God kept him safe. David was feeling weak and discouraged, but God sent Jonathan. David was hated by the king, but God would one day make him king. Probe: Share about a time when you turned to a friend to get you through a difficult situation. How did the Lord use your friend? Connect Up: Sovereignty is defined as supreme power or authority. Free will is defined as voluntary and independent choice. Though ultimately a mystery above our understanding, discuss how God can be both sovereign and allow people to have free will. Connect In: Though each of us has friends to help us through life, how can Christians help other Christians persevere? Consider Galatians 6:2: "Bear one another's burdens, and so fulfill the law of Christ." What does it mean to bear one another's burdens? Read John 13:34-35. How do we fulfill the law of Christ when we support one another? Connect Out: Discuss how you can use the two words but God to reach out to an unbeliever. What did David do to invite this mistreatment by King Saul? Why did David hide himself and his men? "Dear Skip, I penned this letter in the midst of turmoil. The Philippines right now is facing one of the most difficult times I have ever seen since being here. The inflation rate has just hit 13%. This has caused great difficulty for all of us. There have also been major problems with the electrical power, and we are experiencing two-hour blackouts twice a day. This is expected to continue. Manila is also engulfed in a transportation crisis. Then, this morning, we were awoken by the gunfire of another coup attempt. Getting up, I watched from my daughter Anna's bedroom window as two World-War-II-era planes dropped bombs on channel 4 TV. Even now, as I write this, I can hear gunfire. Personally, we have also had major trials and attacks from the enemy. Diana and Anna both contracted an amoebic parasite and needed 10 days of treatment. The landlord raised our rent. Caleb, our dog, was diagnosed with heartworms, and a burglar got into our yard and tried to steal the car. He did not succeed, but he caused some damage before he left." Now, if you spend the money and the energy to go to a foreign field and then have one bad thing happen after another, at some point you've got to question, did we make the right move, right? Now listen to how he ends his letter. "Yet even when faced with an uncertain future, I am realizing the truth of Philippians 4:7, that says, 'the peace of God, which transcends all understanding, will guard your hearts and minds in Christ Jesus.' In fact," he says. "In fact, I feel guilty for feeling so peaceful when many of the people around are panic stricken. No matter what happens, there is no greater peace or joy than to be in God's will. Even in the face of uncertainty, there is an excitement and an expectation of what God is going to do." How's that for a letter of encouragement? Every time I read this, I get convicted, which leads me to a question. How do you view your life? How do you see the reality of things that unfold around you, good or bad? How do you view them? The real question is, what is your world view? You know, everybody has a world view, how you view the world, and we put a lens on every time something happens around us, we read a news story, we hear a report, we experience good or bad, we are viewing those events through a lens-- our world view. Now the Bible, when you read it, has a very distinct worldview. It gives you a very unique lens. And the biblical world view in a nutshell is this-- that everything was created by God, that mankind made really bad first choices that caused disastrous results, that those results have lingered on in every generation, bringing death-- physically, morally, and spiritually-- that God's plan was to let those results play out for thousands of years, while at the same time staging a rescue operation that would take care, first, of the sin problem, then eventually he would return to rule over a restored creation with those that he was sent to save. That's a biblical world view in a nutshell. Now if you do not have that world view, if that is not your perception of things, then most of life is not going to make sense. In fact, what happens around you is going to seem very haphazard, very random, very arbitrary, cruel, and you'll be very lonely. If that is your world view, life is still going to sting, it's still going to hurt, will still be hard, but it's going to be much clearer and more satisfying. And all of that can be boiled down to two words that we are considering in a series-- but God. We're going to be looking at how the Bible presents that reality, and every time it does, it puts that lens back on. This is how to view your life. No matter what happens up to that point, but God changes everything. So we're looking at 1 Samuel 23. I'm going to begin around verse 13 or 14, and what I've done is come up with four statements, four axiomatic statements, or self-evident statements, self-clarifying statements that emerged from the text that we were reading. And the first one is a very simple one I think we would all agree with-- bad things happen to good people. You know, it would wonderful if it was like, bad things only happen to bad people. Good things only happen to good people. But it's not that cut and dried. Bad things happen to good people. Let's see what happened to David. 1 Samuel 23, verse 13 is the end of a previous paragraph, but let's connect them. "So David and his men, about 600, arose and departed from Keilah--" a little town on the border with the Philistines-- "and went wherever they could go. Then it was told Saul that David had escaped from Keilah; so he halted the expedition. And David stayed in the strongholds in the wilderness, and remained in the mountains in the Wilderness of Ziph. Saul sought him every day, but God did not deliver him into his hand. So David saw that Saul had come out to seek his life--" that is, to kill him. "And David was in the Wilderness of Ziph in a forest. Then Jonathan, Saul's son, arose and went to David in the woods and strengthened his hand in God. And he said to him, 'Do not fear, for the hand of Saul my father shall not find you. You shall be king over Israel, and I shall be next to you. Even my father Saul knows that.' So the two of them made a covenant before the Lord. And David stayed in the woods, and Jonathan went to his own house." All right, this is David we're talking about. This is the guy of whom it is said, he was a man after God's own heart. This is David. This is the future King of Israel. This is the ancestor of our Lord and Savior Jesus Christ. This is David. This isn't Cain, this isn't Saul, it's not Haman, it's not Judas, it's not Herod the Great-- it is David, the central figure in God's plan of redemptive history at this particular time in history. And yet, he is suffering. He's being chased and hunted. His life is in danger. And all of that shows us a very self-evident truth-- that bad things happen to good people, that suffering is not a measure of goodness or godliness, that it's not like some cosmic karma that happens. It's like, boy, a lot of bad stuff happened to that family. It must mean they're doing bad things. That's not always the case. In fact, Jesus put it this way-- God causes the sun to rise on the evil and the good, and he sends rain on the righteous and the unrighteous. What we are seeing here play out is the effect of a very jealous king named Saul-- jealous of David, jealous of David's calling, jealous of David's capabilities, forcing David to flee and live for years-- in fact, some believe up to a decade-- as a refugee. So the language here, the names that are mentioned, the places that are mentioned here in the text are somewhere in the region between the hill country of Judea and the Dead Sea region. There's a lot of ravines, a lot of rocks and caves, places to hide, and that's where David is. You probably know this, but some of the psalms that are written in the Book of Psalms written by David were written during this period of time, this decade of time while he was fleeing and he was suffering, and they're very moving psalms. One of them is Psalm 63 that we believe could have been written during this time, and it's because the very top of the psalm says this-- a psalm of David when he was in the wilderness of Judah. That's probably this time. Now that's a psalm you're familiar with. He says, "Oh God, you are my God. Early will I seek you. My soul thirsts for you. My flesh longs for you in a dry and thirsty land where there is no water. So I have looked for you in the sanctuary to behold your power and your glory, because your loving kindness is better than life. My lips shall praise you. Thus I will bless you while I live. I lift up my hands in your name." It's the story, it's the psalm of somebody longing to go back to the central sanctuary worshipping with his people, but is forced to be out in the dry desert areas as a refugee because his life is in danger. Question-- what did David do to invite this kind of mistreatment from King Saul? Answer-- absolutely nothing. He didn't do anything bad to Saul. He didn't say bad things about him. He didn't try to stage a coup to take over. He was faithful, he was diligent, he was obedient, he did everything the king wanted him to do, he took care of some of Israel's enemies, and yet this. In fact, he brings this point up in another psalm-- Psalm 59, certainly written during this period, when David writes, "The mighty--" that is Saul and his armies-- "The mighty gather against me not for my transgressions nor for my sin, oh Lord. They run and prepare themselves through no fault of mine." David is not saying that he is sinlessly perfect. He is just saying, I am not suffering because of my sin. I didn't bring this on because of my sin or my disobedience. So sometimes bad things happen, and there's no direct cause and effect correlation. Bad things happen to good people. Now, when this all started is when David, just a kid, just a shepherd boy, goes to the front lines of the battle and sees this big lug of a Philistine named Goliath, and he defeats him. David kills Goliath. It's a story we're all familiar with. Well, after that battle is done and everybody's going home-- King Saul is going home with his army, and as he's going back home, Saul leading his armies after David got the victory, the people of Israel meet the armies, and they're singing, and they're dancing, and they're partying, and the Bible says the women are singing a song, and here's the lyrics-- "Saul has slain his thousands, and David has slain his tens of thousands." Now first of all, the women were singing that song, which didn't go over well with a very egocentric King Saul, and apparently everybody knew the lyrics to this song, because everybody was singing it. It hit the top of the charts, and his name is in the song, but it's compared to David, who has slain his tens of thousands. So he gets all in a huff and decides to get very jealous of David, saying, well, what more can he have but the kingdom? So from that moment on, the Bible says a jealous eye was cast toward David. A couple of chapters later, when David is in Saul's presence, Saul grabs his spear and throws it, trying to play pin the spear on the musician, but he ducks. David leaves the room, and so Saul comes up with another plan. I've got to get rid of this kid. I'm jealous of him. And it says that he said, I know what I'm going to do. I'm going to give David-- my enemy that I want to kill-- I'm going to give David my daughter, that she may become a snare to him. How would you like to be the daughter of that creepy king, using you as a pawn to kill somebody he doesn't like? Well long story short, while they are together, they're married, they're in the same house, Saul seeks to kill him. David escapes once again. Now, from that moment on, for all of these years, David is suffering as a refugee hunted by the king, and it's probably the lowest moment in David's life, as expressed in some of those psalms that I mentioned. But I've got to tell you something. I'm going to make a confession to you. It's going to sound a little cruel, but I am so glad that David suffered, and I bet you are too, because out of that suffering was produced all of those magnificent psalms, many of them that when we read bring encouragement to us. And you read them go, David went through that? That very deep stuff that still ministers to millions of hearts around the world. The music of the sanctuary is often forged in the trials of the Saints. We benefit from it. Spurgeon said, "God gets his best soldiers out of the highlands of affliction." Now I'm bringing this up as the first major point, because sometimes, if you listen to some believers, you get the idea that they're saying, well, once you come to Christ, all your problems go away. Now is that true? Well, in one sense it's true. Your biggest problem goes away. You're not going to Hell. That's a big problem, and that's your biggest problem. That goes away, but you get a whole bunch of new problems. You now have a target on your back, and all the minions of the Hell and Satan himself will target you. Oh yes, you still have victory, God gives you incredible promises to get through that and be overcomers, but that does not mean life is a downhill slide from that point on. Good things happen to bad people. I want to lead you to a second truth that is self-evident in our story. Not only bad things happen to good people, but bad people can't stop a good God. Bad people can't stop a good God. Now we come to the very crux of this passage in verse 14. Second sentence, second part of verse 14-- "Saul sought him every day, but God did not deliver him into his hands." Now those two words change the story. Those two words pull back the curtain of God's providential care. As James Montgomery Boice said, "If you understand those two words-- but God-- they will save your soul. If you recall them daily and live by them, they will transform your life completely." Verse 14, these two words introduce us to the truth that there is a divine sovereign hand ruling the universe, so that even though bad things happen to good people, even though bad things happen to God's good people, it's not the end of the story. The story continues-- but God. When you have a supreme, all-powerful, universal ruler, malicious plans won't succeed. Now let me restate that. When you have a supreme, all-powerful, universal ruler, malicious plans won't always succeed. Sometimes they do succeed. In fact, in this case, they did succeed for a while. How long did I say David was running from Saul? 10 years. 10 years of suffering. 10 years as a refugee. 10 years living away from his home. 10 years in caves. All because of this madman, this crazy, jealous king. God allowed that to happen. But Saul was only allowed to go so far and no further. He was allowed to display that maniacal, crazy behavior only up to a point, and then God stepped in. And when did God step in? When it served God's purpose. So all of this was allowed to happen, but when it didn't serve God's purpose, it stopped. Maybe your wheels are spinning. You're going, what do you mean served God's purpose? Are you telling me that it served God's purpose for David to suffer 10 years? Uh-huh. Sad to say, but yes. It served God's purpose for David to suffer 10 years. Why? Well I think you know the answer to that question. I think you know that suffering can sometimes be beneficial, in fact, very beneficial to the life of a believer. If we were to have testimony time, and you were to tell me your story or stories, I bet several of you would say something like, it was a dark time. It was a very dismal time. I was so discouraged, I didn't see any way out, but then this is what happened. This is what I learned. This is why I'm better because of it. Spurgeon, once again-- he said so many good things. He said, "The hardest hearted, most unlovely Christians in all the world are those who have never had much trouble, and those who are the most sympathizing, loving, and Christ-like are those that have suffered the most affliction. The worst thing that can happen to any of us is to have our path made too smooth." That's amazing. "The worst thing that can happen to any of us is to have our path made too smooth." But here's the good news-- there is a limit. There is a limit, and the limit is when it violates God's purpose. Now what's God's purpose for David? He's going to be the next what? King. So for him to be the next king, he has to live, not die. That's why we read, "Saul sought him everyday, but God did not deliver him into his hands." So up to a point, this guy is crazy and maniacal, but God wouldn't allow that to happen. That's the difference. It's a profound truth. Remember the story of Job, the book we sort of love but not really? So Job, he was godly. He was the godliest guy on the earth. God even bragged that to Satan. But there's this conversation between Satan and God in chapters one and two, and God allows Satan to go against Job up to a point. Remember, the thing is, don't touch his person. So things around him happen where his life caves in with his loved ones. Second chapter, God says, OK, you can go further, but don't take his life. Spare his life. At each point, Satan was under the parameters of a sovereign God, under the permission of God up to a point and no further. Satan is on a leash. Sometimes I think it's a little too long, but that's God's business. Then you go to the New Testament, Mark chapter 8. A demon-possessed man-- there's not just one, but several demons in this man, and the demons say to Jesus, permit us-- listen to the language-- permit us to go into that herd of swine. They had to get permission. They only acted and reacted upon permission of a sovereign God. What does that mean? It means this-- all of humanity, all the angels in heaven, all the demons of hell, and Satan himself operate under the strict parameters of a sovereign God. So only by permission. And only for God's purposes, and these two words-- but God-- introduce us to that truth. Those two words introduce us to the truth, that God's ways are behind the scenes, but he moves all the scenes that he is behind. This is what's happening in the natural world. But God is acting. What this means to you personally is that if you are going through a fiery trial, that God has his eye on you and his hand on the thermostat. He's watching. He knows how long you've been in there. He knows how hot it's getting. He didn't walk away and forget. He didn't have ADD. He never says, oops. Oh, that poor Christian crispy critter. I've left him in an hour too long. He's really burnt by now. I'd better get him out. He's got his eye on you and his hand on the thermostat. Now what this means even further, if I boil it down, is a profound truth. You are invincible until God is done with you. You are invincible until God is done with you. In Revelation 11, there is a story in the end times of two witnesses that come to the earth. They have miraculous powers, and the world knows about them, they see them, but there is a remarkable text that says, "and when they had finished their testimony, the beast that ascends out of the bottomless pit came against them and killed them." They died. When did they die? When they had finished their testimony. So you are invincible until God is done with you, and once God is done with you, can I just say, who wants to be around here anyway? It's like, well, there's heaven waiting. I'll take that. When God's done with me, get me out of here. I'm out of town. So bad things happen to good people, but bad people can't stop a good God. Here's the third truth, a self-evident, axiomatic truth from this passage. A good God doesn't negate good sense. Now look at verse 15 for a moment. God has just not delivered him into the hand of Saul, verse 14, but look at verse 15. So David saw that Saul had come out to seek his life, and David was in the Wilderness of Ziph in a forest. That means he was looking for cover amongst foliage so that he wouldn't be spotted. Now this is amazing. Why didn't David just throw caution to the wind? I mean, if God is sovereign, and God's God-- God can deliver anybody, why didn't David just walk out in the open and go, oh Saul, here I am! You can't touch me! Answer-- because David is not an idiot. He hid. He made all the right choices. The fact that God is running the universe doesn't turn David into a fatalist. He used every means at his disposal to protect himself. He's still using his mind, he's still applying evasive strategies to get out of a predicament, because David believes both in the sovereignty of God and in the responsibility of man. He believed that God did not deliver him into Saul's hand. Why should he deliver himself into Saul's hand? I bring this up because I find many people very passive in their view about God's sovereign nature. When you talk to them, it's sort of like they feel they're just passengers along for God's wild ride, and they have absolutely no responsibility, no duty. Whatever happens is what God wanted to happen, so why should I think, or deliberate, or plan, or organize, or strategize? David did not think this way. David thought this way-- God may deliver, but I have to duck. I still have to use my common sense and do everything I can, because this is what God might use to deliver me from Saul's hand. So he believed that God's sovereignty is enmeshed in man's responsibility. Now in the New Testament, Jesus gives a parable. I've always found it an interesting parable. It's sort of out of left field. It throws a lot of people when they read it. It's in Luke chapter 16, I believe. It's called "The Parable of the Shrewd Manager." It's the story of a manager who works for the owner of the business. The owner of the business is about to fire him, he knows it, so he goes to all of the clients of the owner and cuts a deal with them. How much do you owe my master? Just cut the debt in half. It's a very illegal-- it'd land him in jail today. It was illegal, self-serving, but he was using his present clout to think of his future. And it says the owner of the company finds out about the manager and actually commends him, not because he stole from him, which he did, but he commands him for thinking far enough in advance to plan and hedge his bet for his own future. What's the point of the parable? Jesus says this in closing it off-- he's making a point about using our heads. He said, "For the people of this world are more shrewd in dealing with their own kind than are the people of the light." That's an amazing statement. He's saying sometimes unbelievers are smarter than believers in thinking through and planning and strategizing their future. He's using a negative example to give a good point. There was a man in New York City. Walked into a bank and asked for a loan. A loan officer came out and introduced himself. He said, how much you want? He goes, I want $5,000. I'm going to Europe on business. I'll be back in two weeks. I'll pay it back in two weeks. You need $5,000? Yes, sir. He goes, well, for us to loan you $5,000, we need some sort of collateral. We need some sort of security. What have you got? The guy who wanted the loan pulled out the keys to his Rolls-Royce and says, it's parked right out in the front. Would that be enough security? And the guy said, well, that would be plenty. So everything checked out. The man got the loan, walks out of the bank with the $5,000. Meanwhile, an employee of the bank takes the keys, gets in the Rolls-Royce, drives it under the bank in the parking garage underneath in secure parking. In two weeks, the businessman returns from Europe, pays back the $5,000 plus the interest, which was $15.41. The loan officer approached the man and said, listen, thank you for your business, but while you were gone, we did a little checking, and we discovered you're a multimillionaire. You don't need a $5,000 loan. So why would you come in here to get a loan for $5,000 when you're a multimillionaire? The man smiled, and he said, where else in New York City can you park a car in a secured area for two weeks for only $15.41? That's why he was a multimillionaire. That boy wasn't playing checkers, he's playing chess. He's strategizing his move. Back to what Jesus said, the people of this world are more shrewd in dealing with their own kind than are the people of light. Listen-- while God is being sovereign, make sure you're being sensible. That's the truth of this. Bad things happen to good people, bad things can't stop a good God, and a good God doesn't negate a good sense. That brings us to the fourth and final truth that emerges, self-authenticating truth from this passage, and that is, bad times call for good friends. Verse 16 introduces such a friend. "Then Jonathan, Saul's son, arose and went to David in the woods, and strengthened his hand in God. And he said to him, 'Do not fear, for the hand of Saul, my father, shall not find you. You shall be King over Israel, and I shall be next to you. Even my father Saul knows that.'" It's a pretty remarkable statement because Jonathan is the son of King Saul, which means, in that day and age, the way kingdoms worked, when the father dies, who's the next king? Son. So the next king after Saul would have been Jonathan. Jonathan says, you're the man after God's own heart. You're the next King. Not me. I'll just be next to you. Even Dad knows that. So verse 18-- "The two of them made a covenant before God, before the Lord, and David stayed in the woods, and Jonathan went to his own house." David's hiding, trusting in a sovereign God, but even though he's trusting in a sovereign God who did deliver him, he's discouraged. He's weak. He's fearful. That's why his buddy says, don't fear. You don't walk up to somebody with a big smile saying don't fear. You don't say to somebody who's very confident, don't fear. It's a nonstarter. It makes no sense. You say that to somebody who's fearful. We know David was fearful and discouraged because many of the psalms we have written during that period expressed that fear, that discouragement-- pouring out his heart, weeping before the Lord. Enter Jonathan. It says he strengthened his hand in God. He encouraged him to be strong in the Lord. Listen, you might be a strong believer, but all believers experience discouragement. All believers experience setbacks. All believers experience low moments of wondering, of second guessing, and their faith goes back and forth. All of us, even the greatest. When you think of Elijah the Prophet, you think of somebody who's bold, right? Unafraid, right? Keeps going, right? That was chapter 18 of First Kings, where the prophet stands with great power of God, and calls fire down from heaven. Very next chapter, he's running from King Ahab and Queen Jezebel. Gets down to the Sinai desert, perks his head up toward heaven, he goes, God, it's enough. Take my life. He goes from victory to suicidal in one chapter. That's Elijah. That's discouragement. When you think of Paul the Apostle, you think of somebody bold, assertive-- put me down, I'll get back up, but he writes to the Corinthians and he says, "We were burdened beyond measure and above strength so that we despaired even of life." That's why at times like that, you need friends like this. Every David needs his Jonathan. Every discouraged person needs his encourager. Don't you love it that Jonathan comes to encourage him. He didn't say, hey, come on, man. You're David. You're the man after God's own heart. You're mister psalm writer. What's up with your discouragement? No, he meets them there. He knows David loves the Lord, but he turns his thought back to God. The best friend you can ever have is somebody who turns your thoughts back to the God you love. Jonathan does that. By the way, their friendship was forged over their mutual love for God. When Jonathan saw David's zeal for the Lord as he stood before King Saul and he said about Goliath, "He's defied the armies of the living God," as he stood before Goliath and he said, "You come to me with a sword, a spear, and a javelin. I come to you in the name of the God of Israel whose armies you have defied." Jonathan hears this little kid talking about his trust in God, and every time he heard it, he said, amen. I like this guy. And from that moment on, they formed a covenant. It says, "their hearts were knit together," and they became friends. So the long and short of it is this-- David was being chased and attacked by Saul, but God kept him safe. David was feeling weak and discouraged, but God sent him Jonathan. David was being hated by the king, but God would one day make him the king. So, back to those two words-- but God. If you can live your life with the truth of those two words, then you can live like my friend who went to the mission field in the Philippines and said, man, all this bad stuff is coming down, but I am living with the peace of God in anticipation and expectation of what God might want to do. I'm praying that all of us will learn to look for the but God in our lives. You may not see it right away. It may take years, and then you'll look back on a situation and go, wow, God was in that. I hated that car accident I was in. I saw no point of that, but then I watched how the Lord used that. I'm praying that you'll learn to live in expectation and anticipation, that but God inserted into your life can change it whole. Father, we thank you for stories such as this, the stories that highlight these two life-altering, life-changing words-- but God. Once God is introduced, once you are put into a situation, once we view you, and we put on the lens of a biblical worldview, everything is remarkably different. Everything that didn't make sense, we believe, will one day fall into place. Everything that seems so random and haphazard is orchestrated, somehow, on multiple levels by an all-powerful sovereign God. And so, Father, we entrust ourselves to you because we know that you love us, and we know that the Bible is a story of romance, of a good God drawing out a fallen, broken people to himself into a love relationship, and that no matter what happens because of us or to us, once you're brought into the picture things can change. I just pray that we would view that and see it, because it's there no matter what, but once we see that, it changes our outlook. May our uplook change our outlook in Jesus' name. Amen! 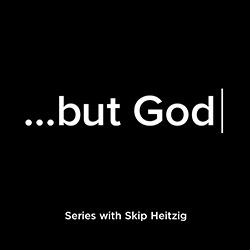 We hope you enjoyed this message from Skip Heitzig of Calvary Church. How will you put the truths that you learn into action in your life? Let us know. Email us at mystory@calvarynm.church. And just a reminder, you can support this ministry with a financial gift at calvarynm.church/give. Thank you for joining us for this teaching from Calvary Church.